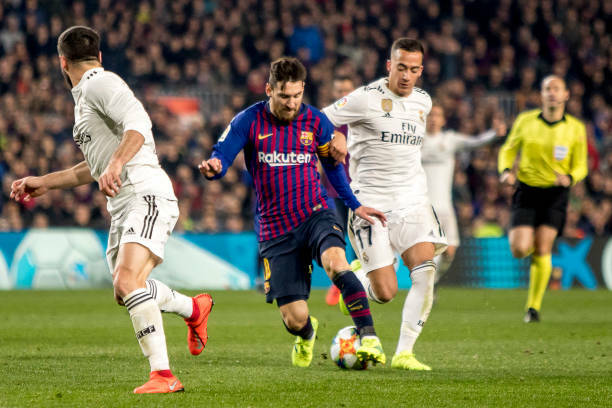 Barcelona will visit Real madrid at Bernebeu on Wednesday night for the second leg of their Copa del Rey semi-final, with the tie level at 1-1 from the first leg at Camp Nou. Lucas Vasquez sent Madrid into a sixth-minute lead in the first leg earlier this month, before Malcom registered in the second period to leave the last-four tie all square. Madrid will have their captain Sergio Ramos back and available after the centre-back missed the win over Levante on Sunday night through suspension. Ramos for Nacho could well be the only outfield change from the team that started against Levante, with Vinicius Junior and Vazquez once again expected to support Karim Benzema in the final third of the field. Isco is available following a back problem, but it seems unlikely that the Spaniard will even make the bench as his problems with Solari show no signs of being resolved. A frustrated Gareth Bale shrugged off the celebrations of his teammates after scoring the winner at the weekend and the Welshman is expected to be back on the bench on Wednesday night. Marcos Llorente is still struggling to overcome a muscular problem, but there will be a start between the sticks for Keylor Navas, who is the team's Copa del Rey goalkeeper. As for Barca,Rafinha,Jasper Cillessen, Arthur and Thomas Vermaelen are still on the sidelines. Cillessen would have started between the sticks had he been fit, but the Dutchman's absence means that Marc-Andre ter Stegen will feature in goal. Samuel Umtiti made his return from injury against Sevilla, but it seems likely that Clement Lenglet will come back into the team for this match, with Sergi Roberto also potentially replacing Nelson Semedo at right-back.